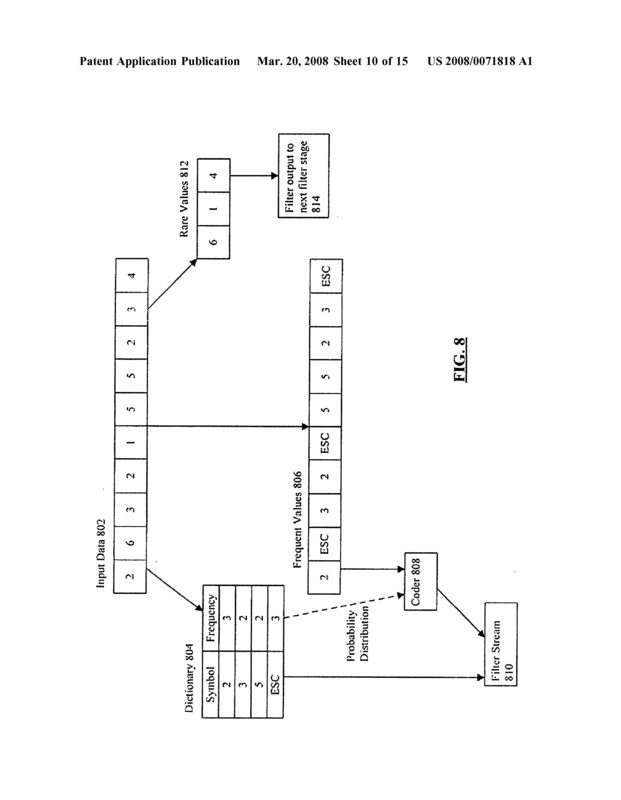 A method for applying adaptive data compression in a relational database system using a filter cascade having at least one compression filter stage in the filter cascade. 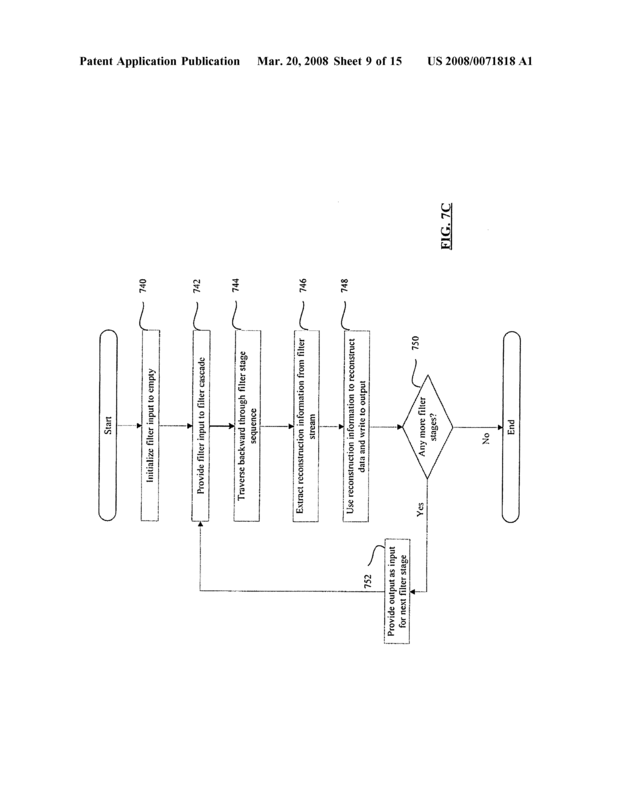 The method comprises applying a data filter associated with the compression filter stage to the data input to produce reconstruction information and filtered data, then compressing the reconstruction information to be included in a filter stream. The filtered data is provided as a compression filter stage output. 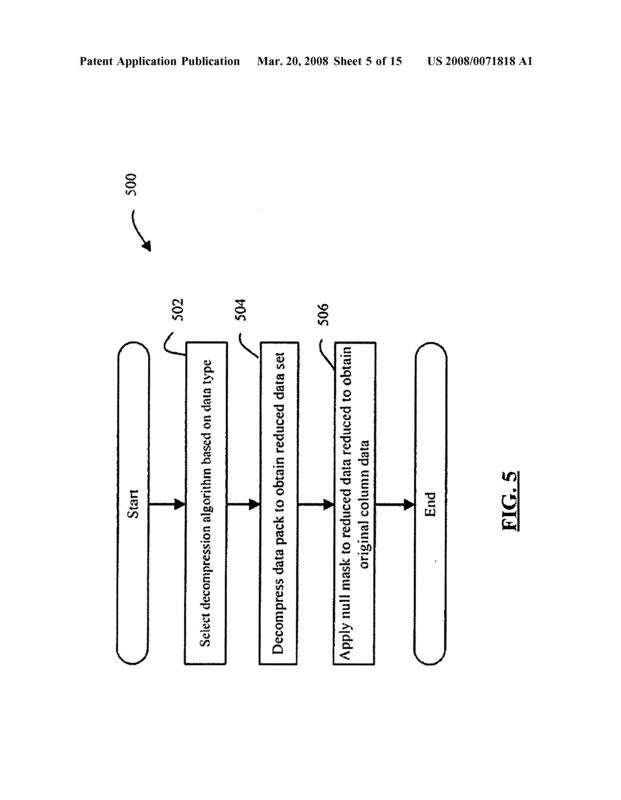 The method may comprise evaluating whether the compression filter stage provides improved compression compared to the data input. The filter stage output may be used as the input of a subsequent compression filter stage. 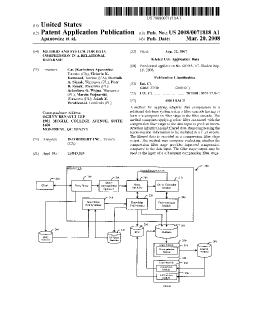 v.) providing the filtered data as a compression filter stage output for the compression filter stage. viii.) repeating steps i.) to v.) for the subsequent compression filter stage. ix.) repeating steps i.) through viii.) a total of n times, where n is an integer representing the number of stages of compression filter stages in the filter cascade. The method according to claim 1, wherein the relational database is a column-oriented relational database. 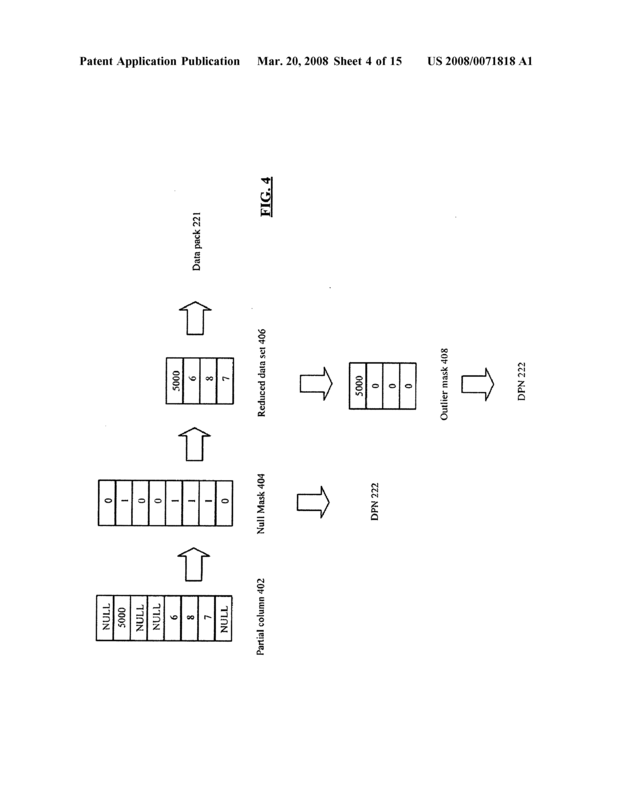 The method according to claim 4, wherein data cells for columns of data in the column-oriented relational database are formed separately and, for each of the columns of data, the data cells are of a specified number of records grouped together as a data unit, the data units being provided as the data input to the compression filter stage of the filter cascade at step i.). The method according to claim 5, wherein the specified number is selected from the group consisting of: 64 kilobytes of records and 65,536 records. The method according to claim 1, wherein each of the compression filter stages has a compression algorithm for compressing the reconstruction information and types of compression algorithms for each of the compression filter stages and parameters of the compression algorithms are dynamically adjusted for the data input. The method according to claim 7, wherein the compression algorithm is selected from the group consisting of: arithmetic encoding, range coding, Shannon-Fano-Elias coding, Shannon coding, Huffman coding, Rice coding, Golomb coding, Tunstall coding, and prediction by partial matching. The method according to claim 3, wherein once all of the compression filter stages of the filter cascade are applied, the data input that was supplied to a first compression filter stage of the filter cascade is all represented in the filter stream with a final compression filter stage of the filter cascade having no output, the filter stream comprising compressed reconstruction information from each compression filter stage of the filter cascade. The method according to claim 9, wherein the data input is recoverable by decompressing the filter stream and applying corresponding decompression filter stages in reverse order to the compression filter stages. The method according to claim 1, wherein the compression filter stages are applied in any order. The method according to claim 1, wherein the compression filter stages are individually applied at least one time. The method according to claim 3, wherein the data input is a data unit having a plurality of data elements and at least one compression filter stage of the at least one compression filter stage of the filter cascade has a data filter that removes null elements from the data unit and creates a null map indicating the positions of the null elements. 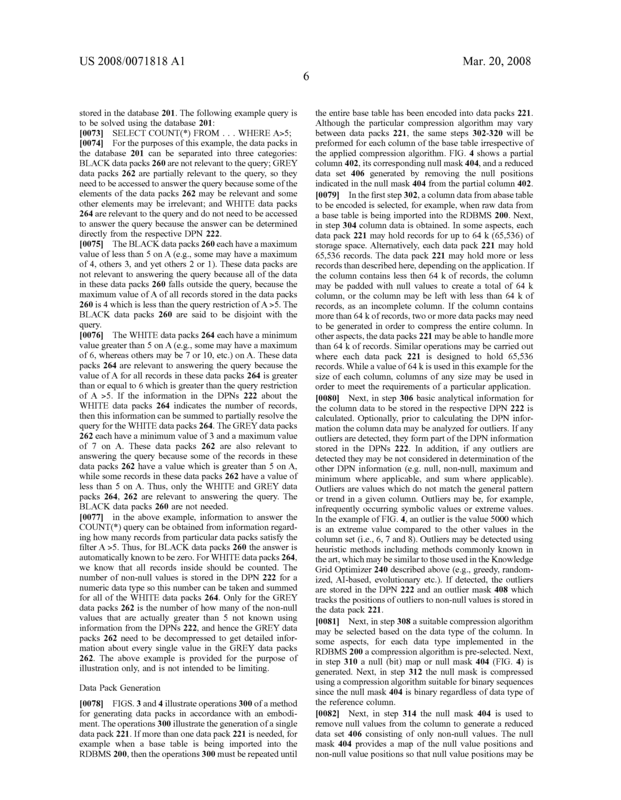 The method according to claim 13, wherein the null map comprises a bit map series of zeros and ones, each bit representing each data element, a zero bit indicating the presence of a non-null element and a one bit indicating the presence of a null element, the resulting bit map series being included in the reconstruction information. The method according to claim 13 wherein the null elements are removed from the data input, and the data input with the null elements removed is provided in the filtered data. The method according to claim 3, wherein the data input includes a data unit having a plurality of data elements of numeric data, the numeric data having an element with a minimum value, and at least one compression filter stage has a data filter that subtracts the minimum value from all of the data elements of the data unit, the data elements with the minimum value subtracted being provided as the filtered data, the minimum value being included in the reconstruction information. The method according to claim 3, wherein the data input includes a data unit having a plurality of data elements of numeric data, the numeric data having a greatest common divisor (GCD) and at least one compression filter stage has a data filter that reduces each data element of the data unit by dividing each data element by the GCD and providing the reduced data unit as the filtered data, the GCD value being included in the reconstruction information. 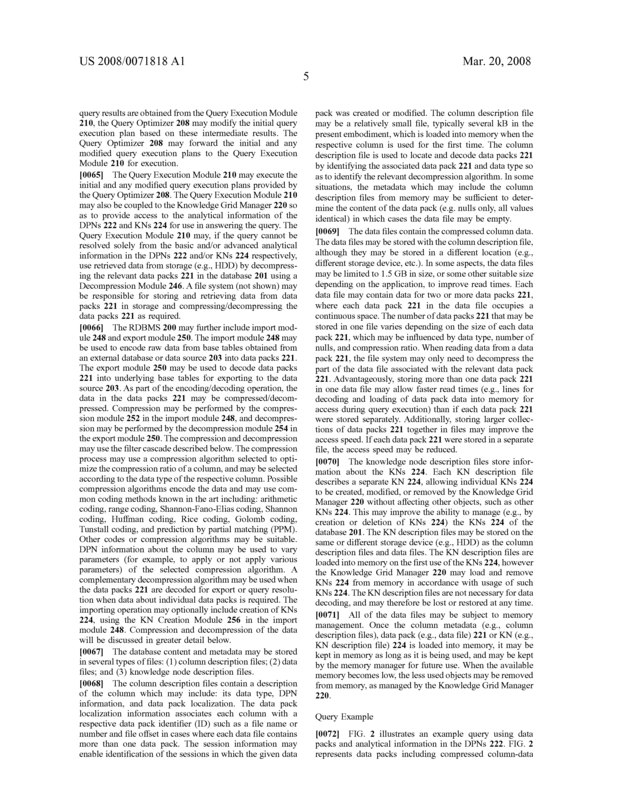 The method according to claim 3, wherein the data input includes a data unit having a plurality of data elements, and at least one compression filter stage has a data filter that builds a partial dictionary of elements that have an occurrence frequency in the data unit greater than a predetermined frequency, the elements of the data unit that are included in the dictionary being removed from the data unit and being included in the reconstruction information, data elements of the data unit that are not included in the dictionary being included in the filtered data. 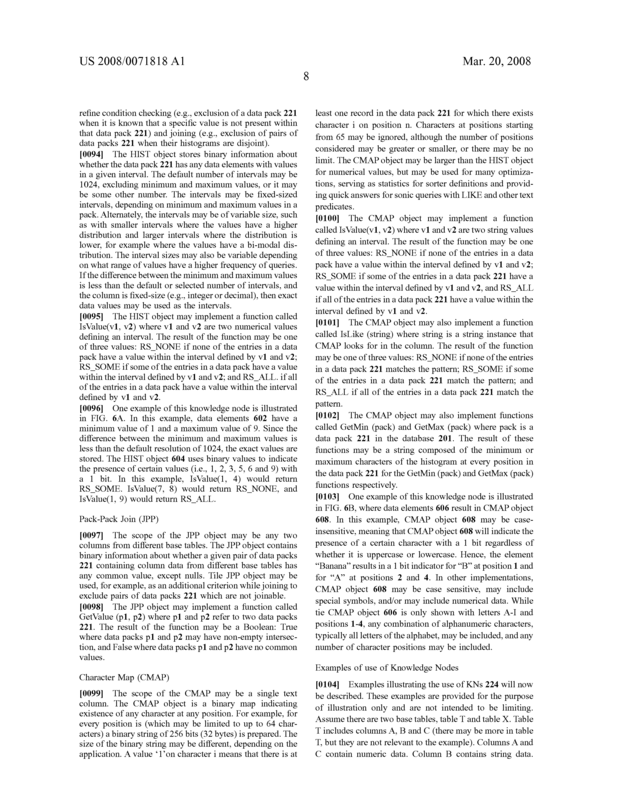 The method according to claim 3, wherein the data input includes a data unit having a plurality of data elements, and at least one compression filter stage has a data filter that builds a partial dictionary of elements comprising selected bits of all of the data elements, the selected bits being removed from the data unit and included in the reconstruction information, the remaining bits of the data elements being included in the filtered data. The method according to claim 19, wherein the selected bits comprise top bits of the data elements. The method according to claim 19, wherein the selected bits comprise bottom bits of the data elements. The method according to claim 3, wherein the data input includes a data unit having a plurality of data elements of numeric data, the data elements having an element with a maximum value, and at least one compression filter stage has a data filter that calculates, for each element, a difference between one element and the next element and the differences are represented in modulo of the maximum value +1, the maximum value being included in the reconstruction information, and a first data element and the differences being included in the filtered data. 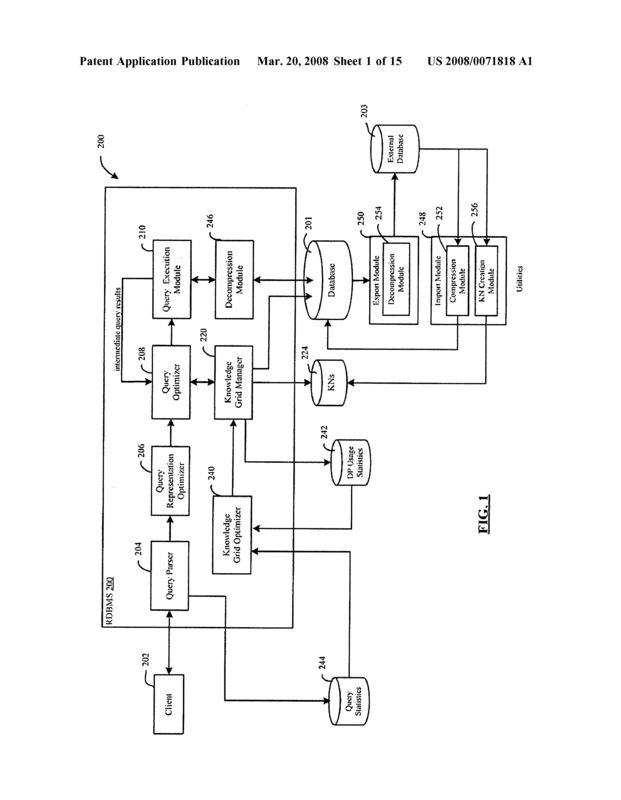 The method according to claim 3, wherein the data input includes a data unit having a plurality of data elements, at least one data element having an outlying value, and at least one compression filter stage has a data filter that removes the outlying value from the data input, the outlying value and an indicator of the position of the outlying value being included in the reconstruction information, the data input with the outlying value removed being included in the filtered data. 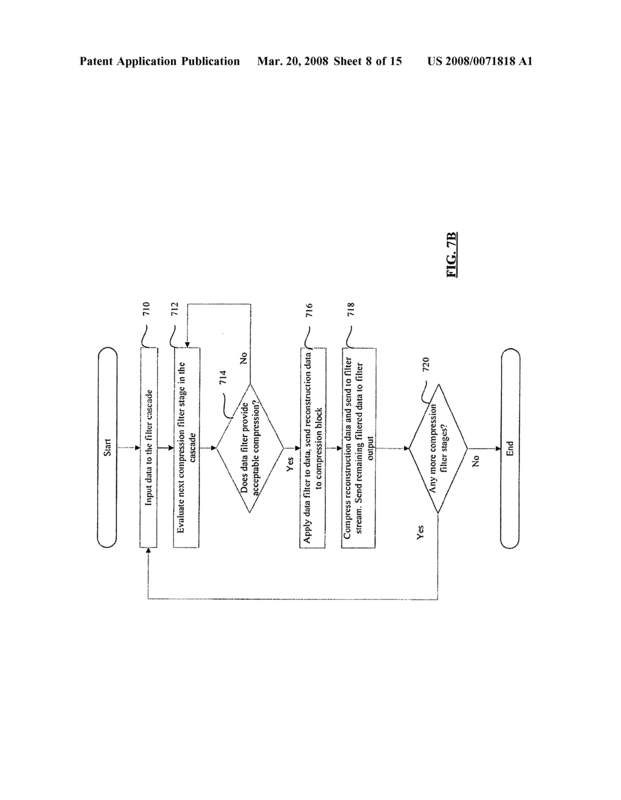 The method according to claim 3, wherein the data input includes a data unit having a plurality of elements and at least one compression filter stage has a data filter that includes all the elements in the reconstruction information, and the compression filter stage output is empty. wherein the probabilities in the dictionary are updated as each subsequent character is processed. The method according to claim 3, wherein each compression filter stage has an associated predetermined compression algorithm for compressing the reconstruction information. repeating the applying and compressing steps using the compression filter output as an input for at least one subsequent compression filter stage. The method of claim 27, wherein the relational database is a column-oriented relational database. The method of claim 28, wherein data cells for columns of data in the column-oriented relational database are formed separately and, for each of the columns of data, the data cells are of a specified number of records grouped together as a data unit, the data units being provided as the data input. The method of claim 29, wherein the specified number is selected from the group consisting of: 64 kilobytes of records and 65,536 records. The method of claim 27, wherein the compressing step comprises applying a compression algorithm, the compression algorithm for each compression filter and parameters of the compression algorithm being dynamically adjustable based on the data input. The method of claim 31, wherein the compression algorithm is selected from the group consisting of: arithmetic coding, range coding, Shannon-Fano-Elias coding, Shannon coding, Huffman coding, Rice coding, Golomb coding, Tunstall coding, and prediction by partial matching. The method of claim 27 wherein the applying and compressing steps are repeated until the compression filter output of a final compression filter stage in the filter cascade is empty. 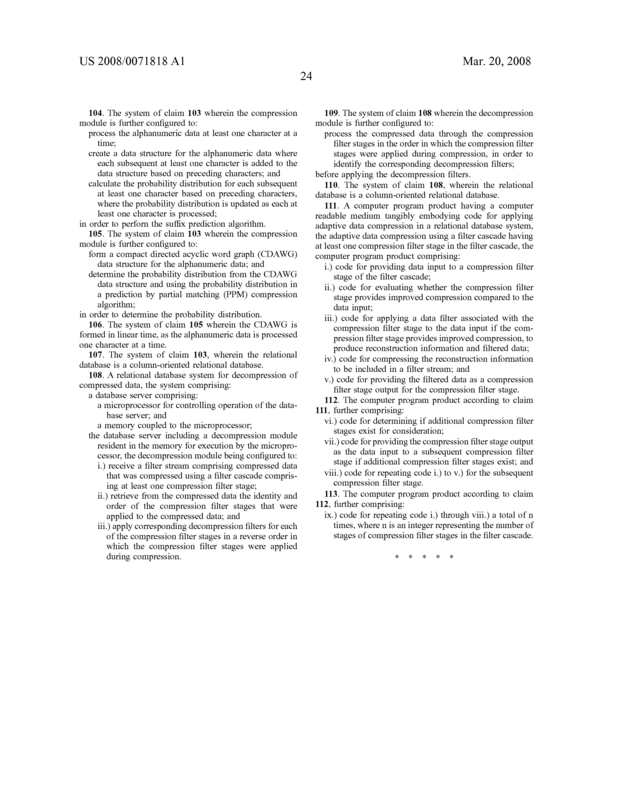 The method of claim 27 wherein the compression filter stages are applied in a pre-determined order. The method of claim 27 wherein at least one compression filter stage is applied more than once. where evaluation of the given compression filter stage finds that the given compression filter stage does not provide improved compression, the given compression filter stage is not applied, and the evaluating step is repeated with at least one subsequent compression filter stage. The method of claim 36 wherein the evaluating step comprises an algorithm adapted for the given compression filter stage. The method of claim 27 wherein at least one compression filter stage has a data filter that filters the data input by removing null elements in the data input and creates a null mask indicating the location of the null elements, the null mask being included in the reconstruction information and the data having the null elements removed being included in the filtered data. 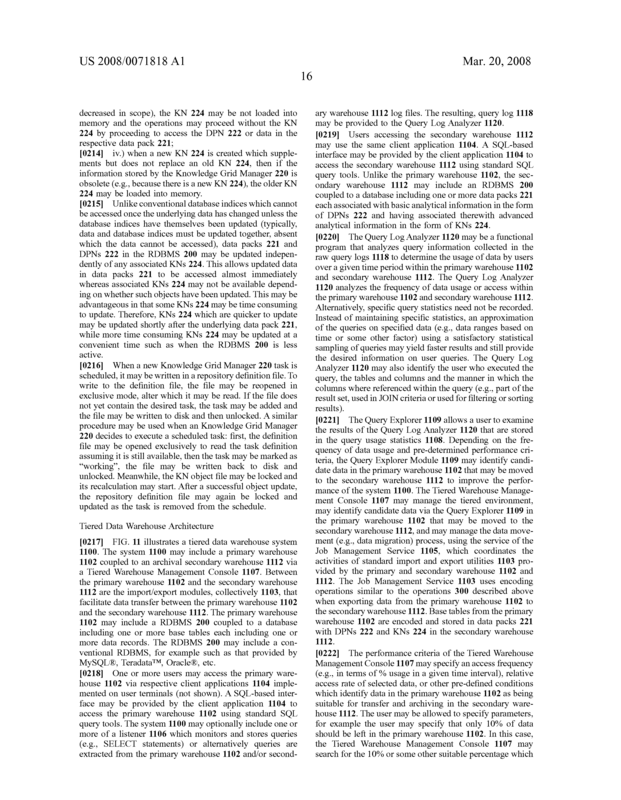 The method of claim 38, wherein the null map comprises a bit map series of zeros and ones, each bit representing each data element, a zero bit indicating the presence of a non-null element and a one bit indicating the presence of a null element, the resulting bit map series being included in the reconstruction information. The method of claim 38 wherein the null elements are removed from the data input, and the data input with the null elements removed is provided in the filtered data. 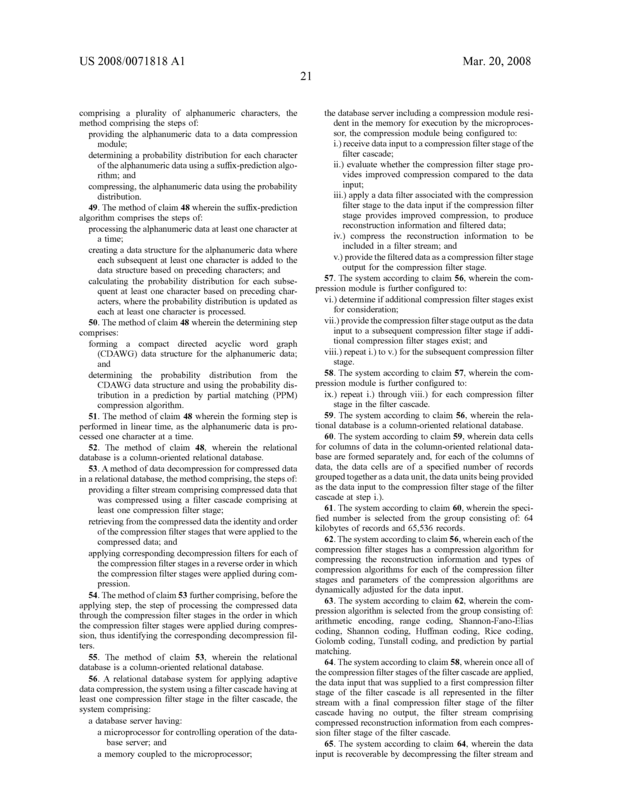 The method of claim 27 wherein the data input has a data element with a minimum value, and at least one compression filter stage has a data filter that filters the data input by subtracting the minimum value from each element, the minimum value being included in the reconstruction information and the data input having the minimum value subtracted from each data element being included in the filtered data. The method of claim 27 wherein the data input has a greatest common divisor (GCD) among a number of elements, and at least one compression filter stage has a data filter that filters the data input by dividing each data element by the GCD, the GCD being included in the reconstruction information and the data input with the number of elements having been divided by the GCD being included in the filtered data. 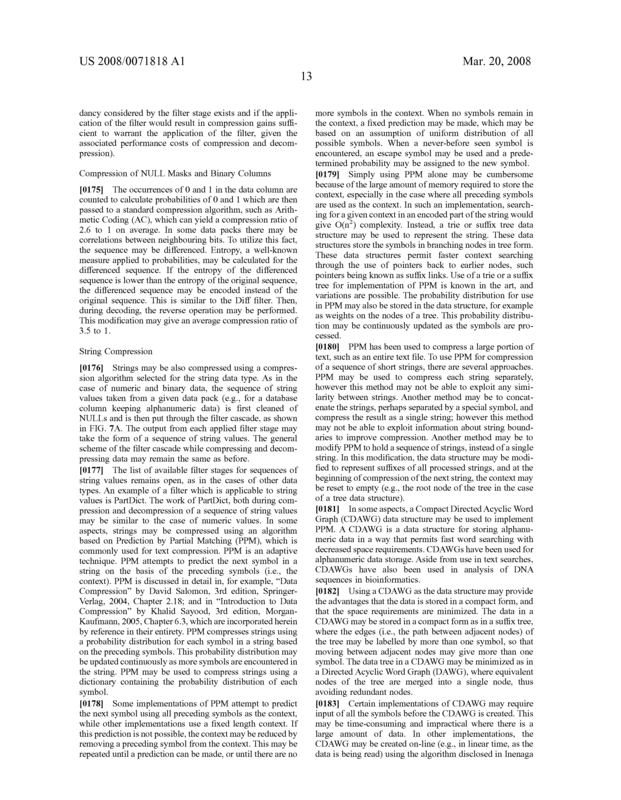 The method of claim 27 wherein the data input has a first group of elements each having a high frequency of occurrence and second group of elements each having a low frequency of occurrence, and at least one compression filter stage has a data filter that filters the data input by associating a symbol with each element in the first group, creating a dictionary associating each symbol with each respective element of the first group and respective frequencies of occurrence, the dictionary and the first group of elements being included in the reconstruction information and the elements of the second group being included in the filtered data. 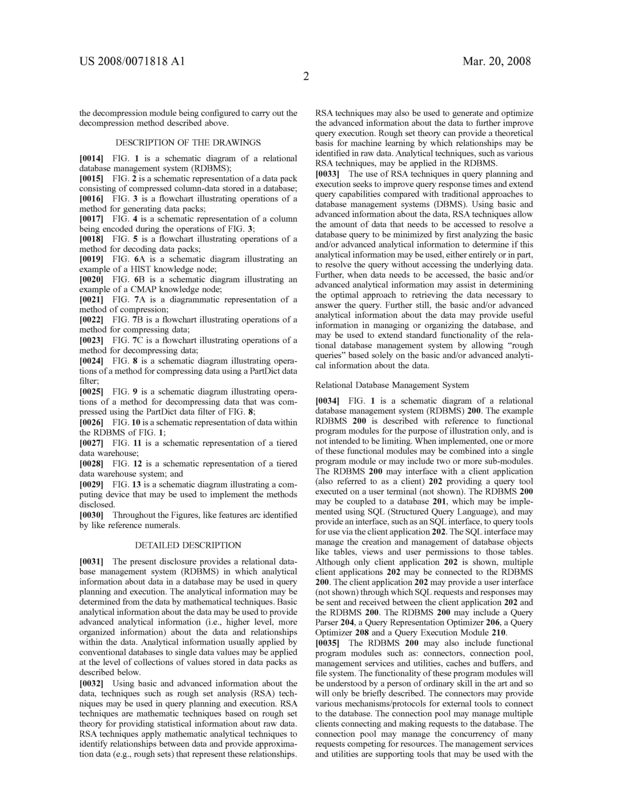 The method of claim 27 wherein the data input has a plurality of elements, each comprising a plurality of bits, and at least one compression filter has a data filter that creates a dictionary associating selected bits of each element with a symbol, the dictionary and the selected bits being included in the reconstruction information and the elements with the selected bits removed being included in the filtered data. 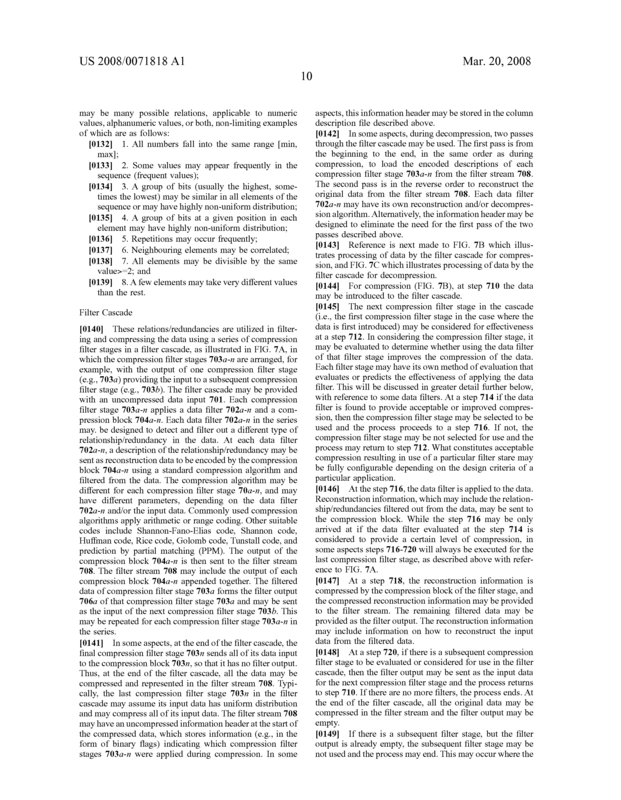 The method of claim 44 wherein the selected bits comprise top bits of each element. 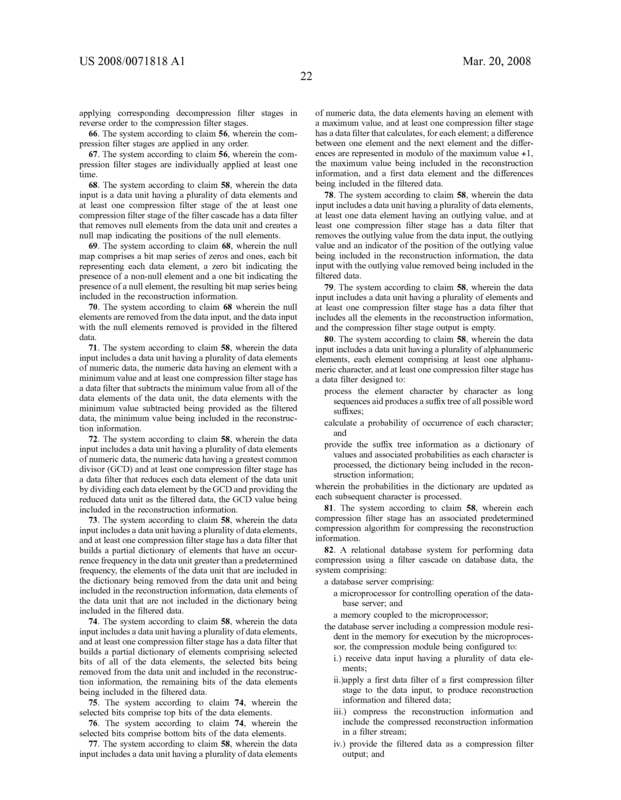 The method of claim 44 wherein the selected bits comprise bottom bits of each element. 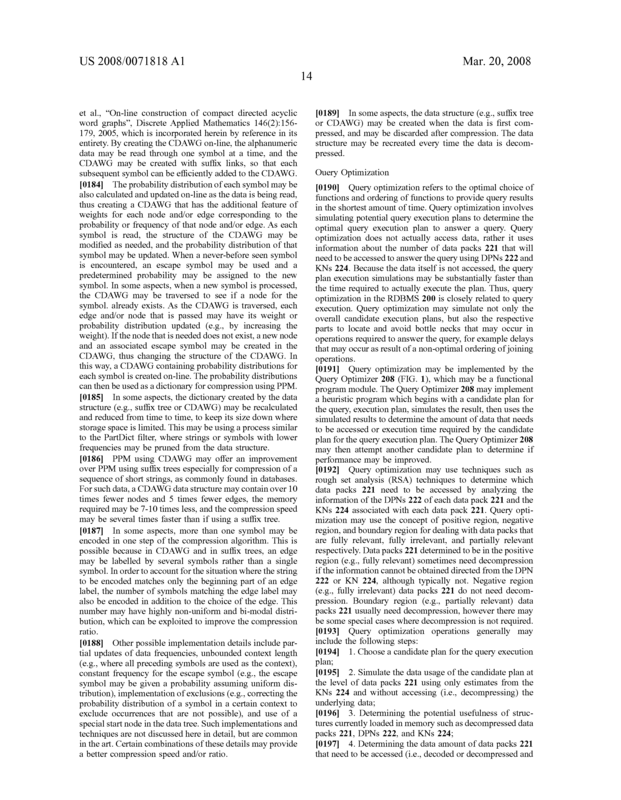 The method of claim 27 wherein the data input has a plurality of numeric elements, the elements having a maximum value, and at least one compression filter has a data filter that, for each element, calculates differences between one element and a subsequent element, the differences being represented in modulo of the maximum value +1, the differences forming a difference sequence, and the maximum value being included in the reconstruction information and a first element and the difference sequence being included in the filtered data. compressing, the alphanumeric data using the probability distribution. calculating the probability distribution for each subsequent at least one character based on preceding characters, where the probability distribution is updated as each at least one character is processed. determining the probability distribution from the CDAWG data structure and using the probability distribution in a prediction by partial matching (PPM) compression algorithm. The method of claim 48 wherein the forming step is performed in linear time, as the alphanumeric data is processed one character at a time. The method of claim 48, wherein the relational database is a column-oriented relational database. applying corresponding decompression filters for each of the compression filter stages in a reverse order in which the compression filter stages were applied during compression. The method of claim 53 further comprising, before the applying step, the step of processing the compressed data through the compression filter stages in the order in which the compression filter stages were applied during compression, thus identifying the corresponding decompression filters. The method of claim 53, wherein the relational database is a column-oriented relational database. v.) provide the filtered data as a compression filter stage output for the compression filter stage. viii.) repeat i.) to v.) for the subsequent compression filter stage. ix.) repeat i.) through viii.) for each compression filter stage in the filter cascade. The system according to claim 56, wherein the relational database is a column-oriented relational database. The system according to claim 59, wherein data cells for columns of data in the column-oriented relational database are formed separately and, for each of the columns of data, the data cells are of a specified number of records grouped together as a data unit, the data units being provided as the data input to the compression filter stage of the filter cascade at step i.). The system according to claim 60, wherein the specified number is selected from the group consisting of: 64 kilobytes of records and 65,536 records. The system according to claim 56, wherein each of the compression filter stages has a compression algorithm for compressing the reconstruction information and types of compression algorithms for each of the compression filter stages and parameters of the compression algorithms are dynamically adjusted for the data input. 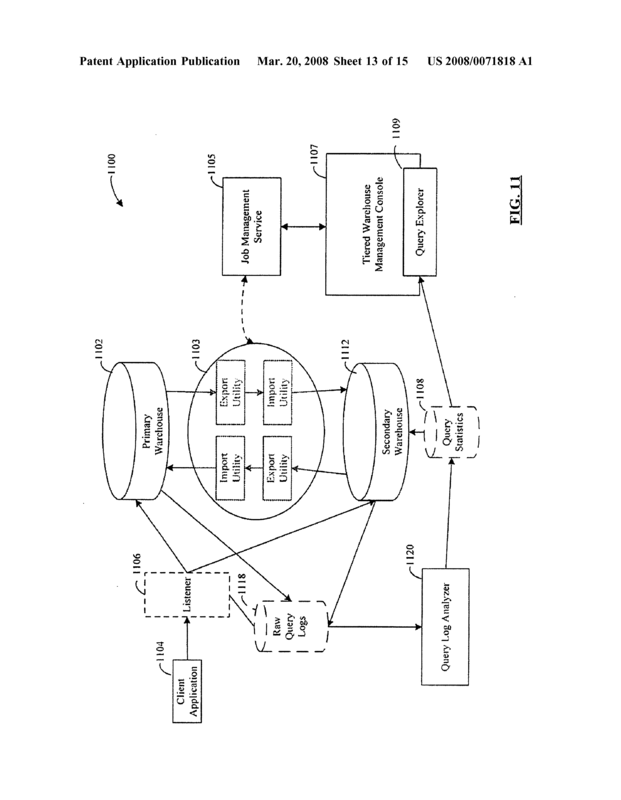 The system according to claim 62, wherein the compression algorithm is selected from the group consisting of: arithmetic encoding, range coding, Shannon-Fano-Elias coding, Shannon coding, Huffman coding, Rice coding, Golomb coding, Tunstall coding, and prediction by partial matching. The system according to claim 58, wherein once all of the compression filter stages of the filter cascade are applied, the data input that was supplied to a first compression filter stage of the filter cascade is all represented in the filter stream with a final compression filter stage of the filter cascade having no output, the filter stream comprising compressed reconstruction information from each compression filter stage of the filter cascade. 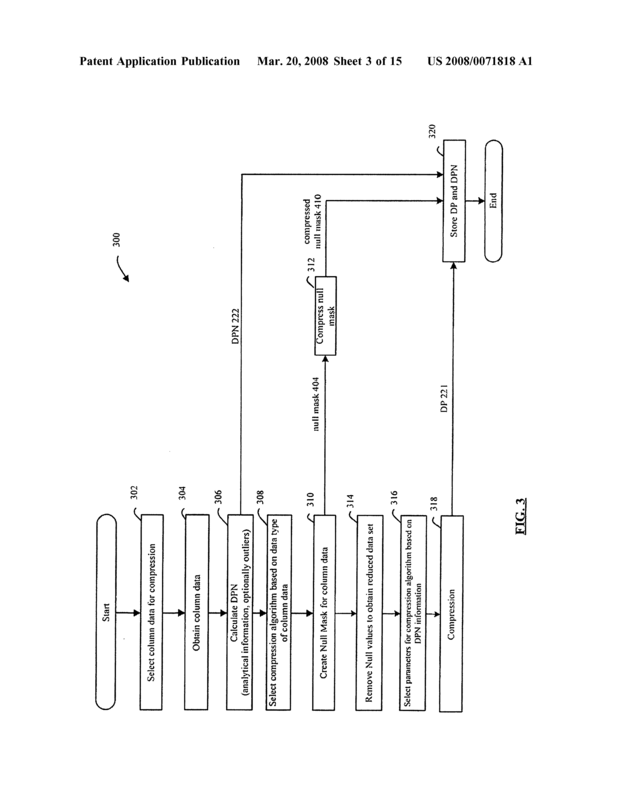 The system according to claim 64, wherein the data input is recoverable by decompressing the filter stream and applying corresponding decompression filter stages in reverse order to the compression filter stages. The system according to claim 56, wherein the compression filter stages are applied in any order. The system according to claim 56, wherein the compression filter stages are individually applied at least one time. The system according to claim 58, wherein the data input is a data unit having a plurality of data elements and at least one compression filter stage of the at least one compression filter stage of the filter cascade has a data filter that removes null elements from the data unit and creates a null map indicating the positions of the null elements. 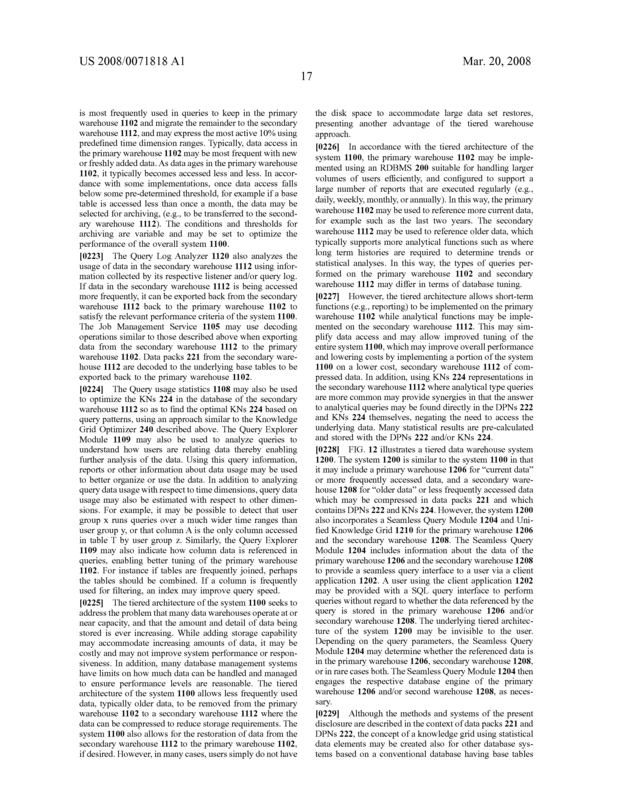 The system according to claim 68, wherein the null map comprises a bit map series of zeros and ones, each bit representing each data element, a zero bit indicating the presence of a non-null element and a one bit indicating the presence of a null element, the resulting bit map series being included in the reconstruction information. The system according to claim 68 wherein the null elements are removed from the data input, and the data input with the null elements removed is provided in the filtered data. The system according to claim 58, wherein the data input includes a data unit having a plurality of data elements of numeric data, the numeric data having an element with a minimum value and at least one compression filter stage has a data filter that subtracts the minimum value from all of the data elements of the data unit, the data elements with the minimum value subtracted being provided as the filtered data, the minimum value being included in the reconstruction information. The system according to claim 58, wherein the data input includes a data unit having a plurality of data elements of numeric data, the numeric data having a greatest common divisor (GCD) and at least one compression filter stage has a data filter that reduces each data element of the data unit by dividing each data element by the GCD and providing the reduced data unit as the filtered data, the GCD value being included in the reconstruction information. 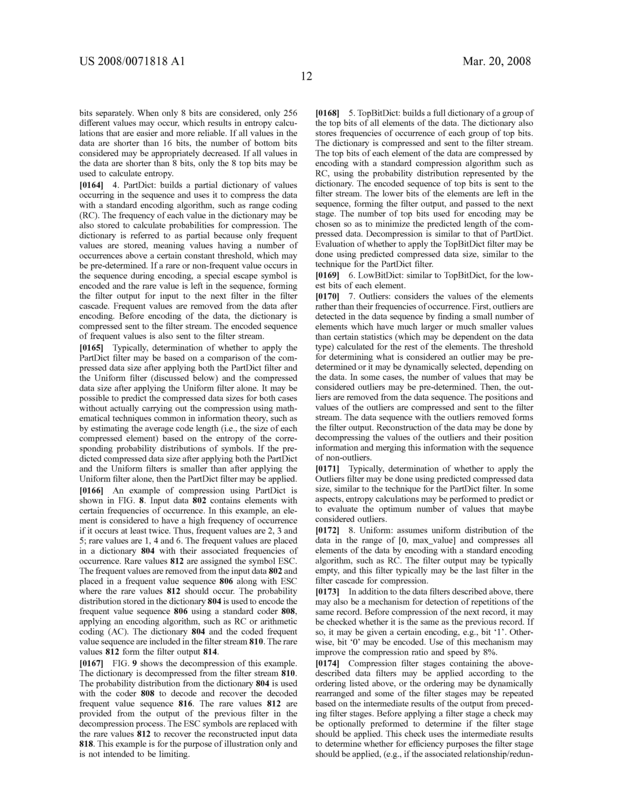 The system according to claim 58, wherein the data input includes a data unit having a plurality of data elements, and at least one compression filter stage has a data filter that builds a partial dictionary of elements that have an occurrence frequency in the data unit greater than a predetermined frequency, the elements of the data unit that are included in the dictionary being removed from the data unit and being included in the reconstruction information, data elements of the data unit that are not included in the dictionary being included in the filtered data. 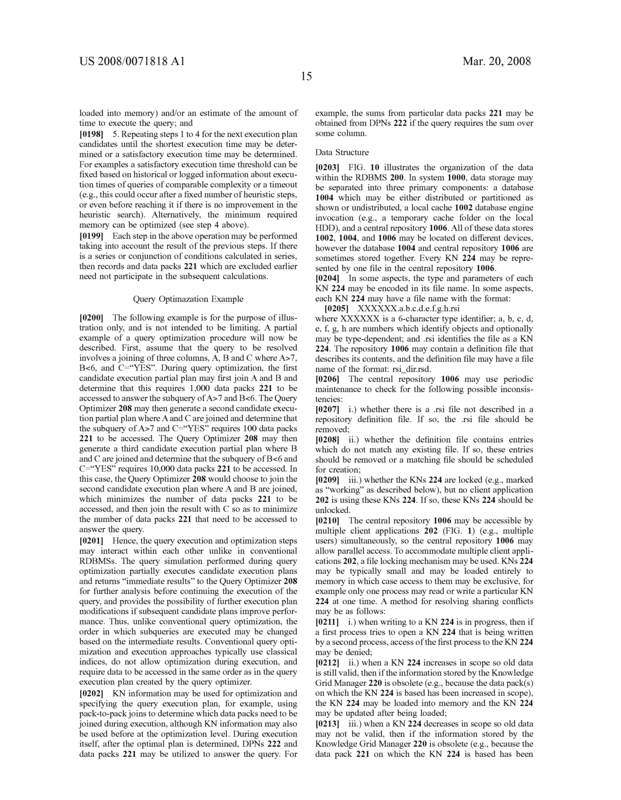 The system according to claim 58, wherein the data input includes a data unit having a plurality of data elements, and at least one compression filter stage has a data filter that builds a partial dictionary of elements comprising selected bits of all of the data elements, the selected bits being removed from the data unit and included in the reconstruction information, the remaining bits of the data elements being included in the filtered data. The system according to claim 74, wherein the selected bits comprise top bits of the data elements. The system according to claim 74, wherein the selected bits comprise bottom bits of the data elements. The system according to claim 58, wherein the data input includes a data unit having a plurality of data elements of numeric data, the data elements having an element with a maximum value, and at least one compression filter stage has a data filter that calculates, for each element; a difference between one element and the next element and the differences are represented in modulo of the maximum value +1, the maximum value being included in the reconstruction information, and a first data element and the differences being included in the filtered data. 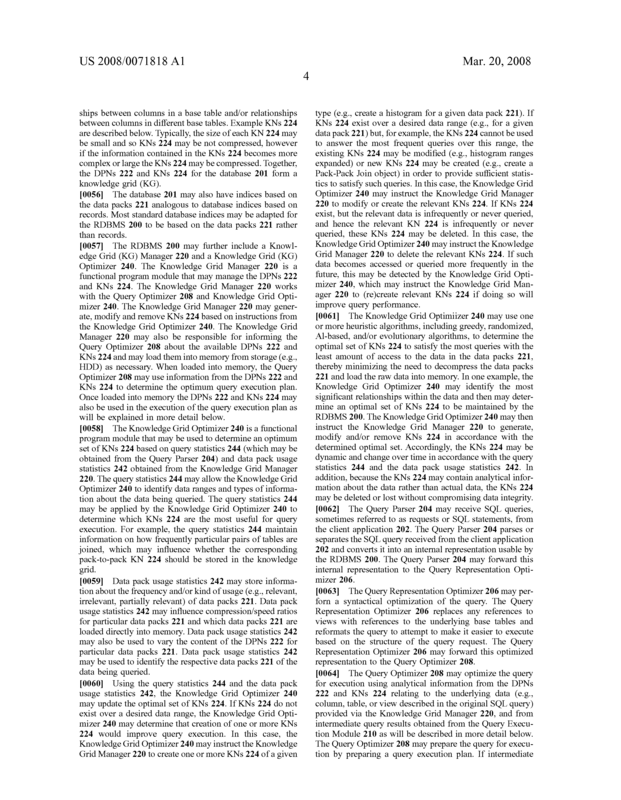 The system according to claim 58, wherein the data input includes a data unit having a plurality of data elements, at least one data element having an outlying value, and at least one compression filter stage has a data filter that removes the outlying value from the data input, the outlying value and an indicator of the position of the outlying value being included in the reconstruction information, the data input with the outlying value removed being included in the filtered data. The system according to claim 58, wherein the data input includes a data unit having a plurality of elements and at least one compression filter stage has a data filter that includes all the elements in the reconstruction information, and the compression filter stage output is empty. The system according to claim 58, wherein each compression filter stage has an associated predetermined compression algorithm for compressing the reconstruction information. v.) repeat ii.) and iii.) using the compression filter output as an input for at least one subsequent compression filter stage. 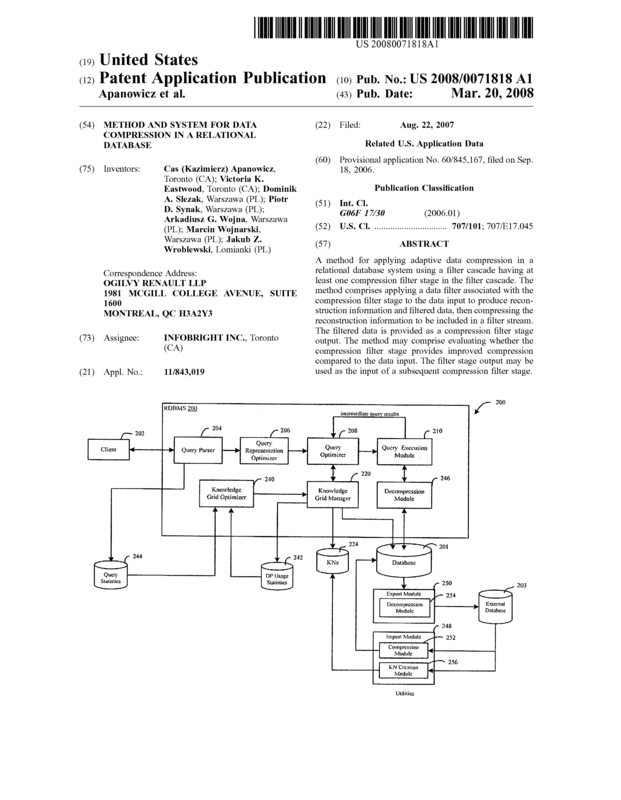 The system of claim 82, wherein the relational database is a column-oriented relational database. 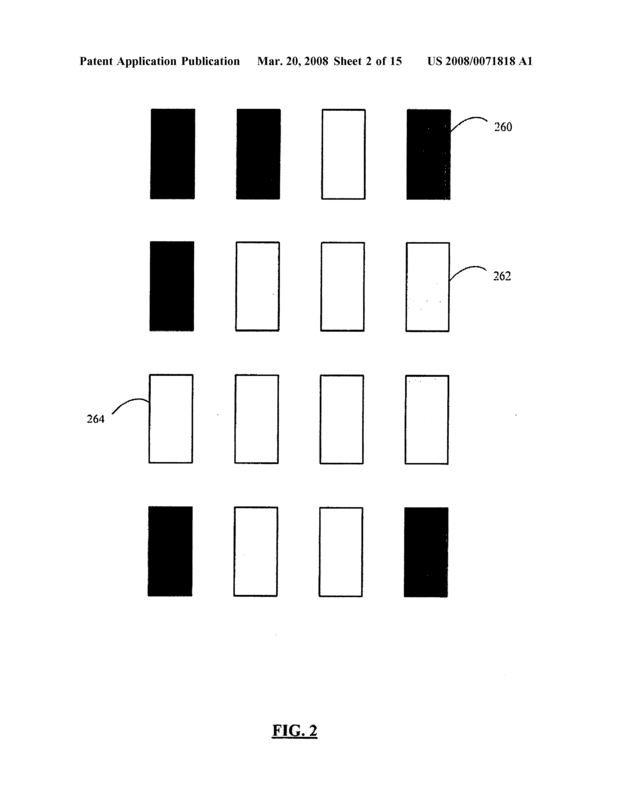 The system of claim 83, wherein data cells for columns of data in the column-oriented relational database are formed separately and, for each of the columns of data, the data cells are of a specified number of records grouped together as a data unit, the data units being provided as the data input. The system of claim 84, wherein the specified number is selected from the group consisting of: 64 kilobytes of records and 65,536 records. The system of claim 82, wherein iii.) 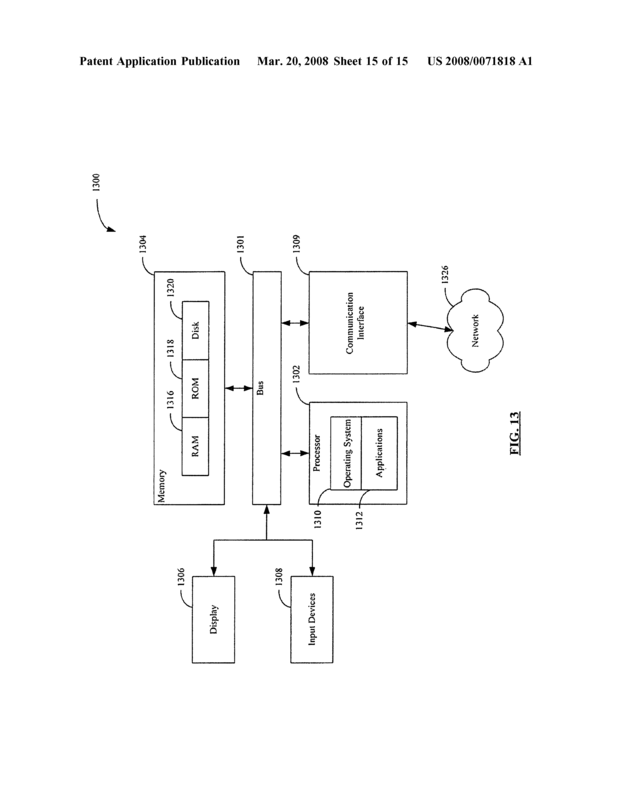 comprises the application of a compression algorithm, the compression algorithm for each compression filter and parameters of the compression algorithm being dynamically adjustable based oil the data input. 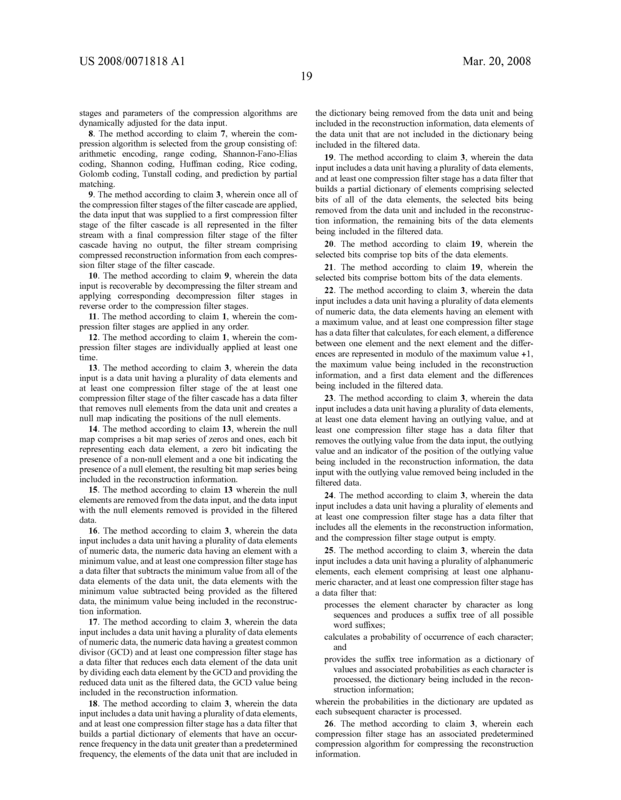 The system of claim 86, wherein the compression algorithm is selected from the group consisting of: arithmetic coding, range coding, Shannon-Fano-Elias coding, Shannon coding, Huffman coding, Rice coding, Golomb coding, Tunstall coding, and prediction by partial matching. The system of claim 82 wherein the compression module is further configured to repeat ii.) and iii.) until the compression filter output of a final compression filter stage in the filter cascade is empty. The system of claim 82 wherein the compression filter stages are applied in a pre-determined order. The system of claim 82 wherein at least one compression filter stage is applied more than once. before applying a data filter. 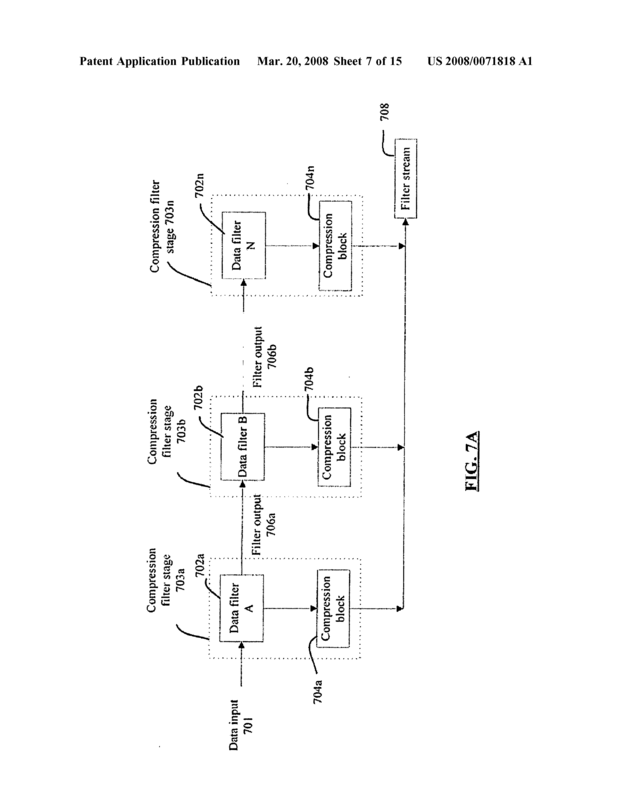 The system of claim 91 wherein the evaluation comprises application of an algorithm adapted for the given compression filter stage. The system of claim 82 wherein at least one compression filter stage has a data filter that filters the data input by removing null elements in the data input and creates a null mask indicating the location of the null elements, the null mask being included in the reconstruction information and the data having the null elements removed being included in the filtered data. 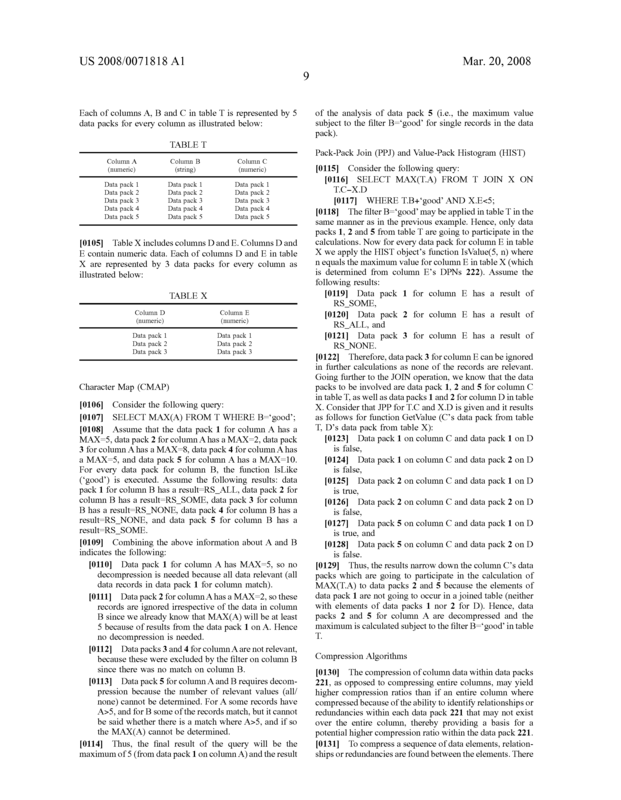 The system of claim 93, wherein the null map comprises a bit map series of zeros and ones, each bit representing each data element, a zero bit indicating the presence of a non-null element and a one bit indicating the presence of a null element, the resulting bit map series being included in the reconstruction information. The system of claim 93 wherein the null elements are removed from the data input, and the data input with the null elements removed is provided in the filtered data. 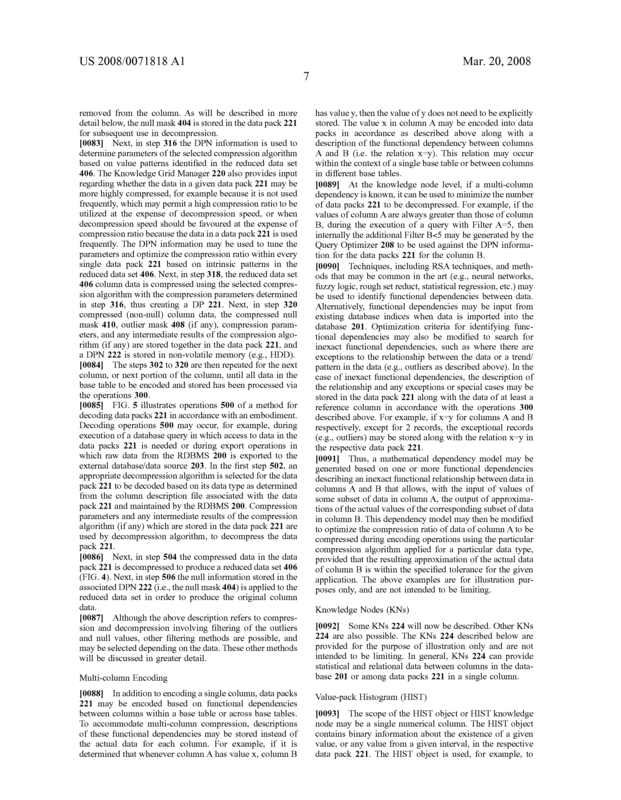 The system of claim 82 wherein the data input has a data element with a minimum value, and at least one compression filter stage has a data filter that filters the data input by subtracting the minimum value from each element, the minimum value being included in the reconstruction information and the data input having the minimum value subtracted from each data element being included in the filtered data. The system of claim 82 wherein the data input has a greatest common divisor (GCD) among a number of elements, and at least one compression filter stage has a data filter that filters the data input by dividing each data element by the GCD, the GCD being included in the reconstruction information and the data input with the number of elements having been divided by the GCD being included in the filtered data. 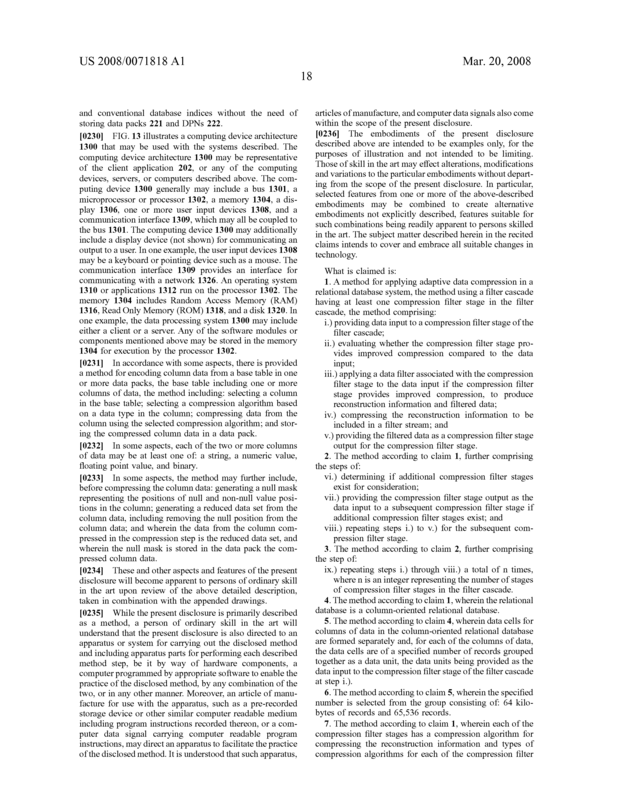 The system of claim 82 wherein the data input has a first group of elements each having a high frequency of occurrence and second group of elements each having a low frequency of occurrence, and at least one compression filter stage has a data filter that filters the data input by associating a symbol with each element in the first group, creating a dictionary associating each symbol with each respective element of the first group and respective frequencies of occurrence, the dictionary and the first group of elements being included in the reconstruction information and the elements of the second group being included in the filtered data. 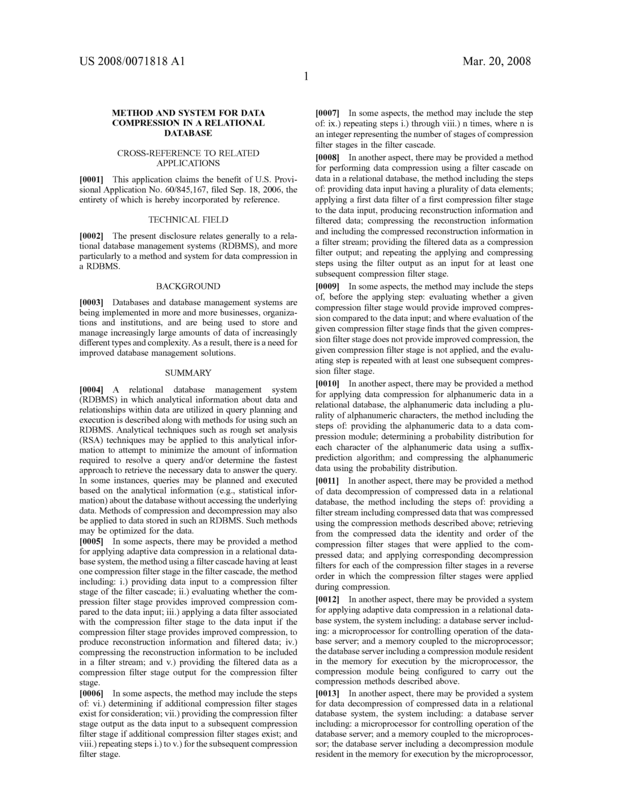 The system of claim 82 wherein the data input has a plurality of elements, each comprising a plurality of bits, and at least one compression filter has a data filter that creates a dictionary associating selected bits of each element with a symbol, the dictionary and the selected bits being included in the reconstruction information and the elements with the selected bits removed being included in the filtered data. 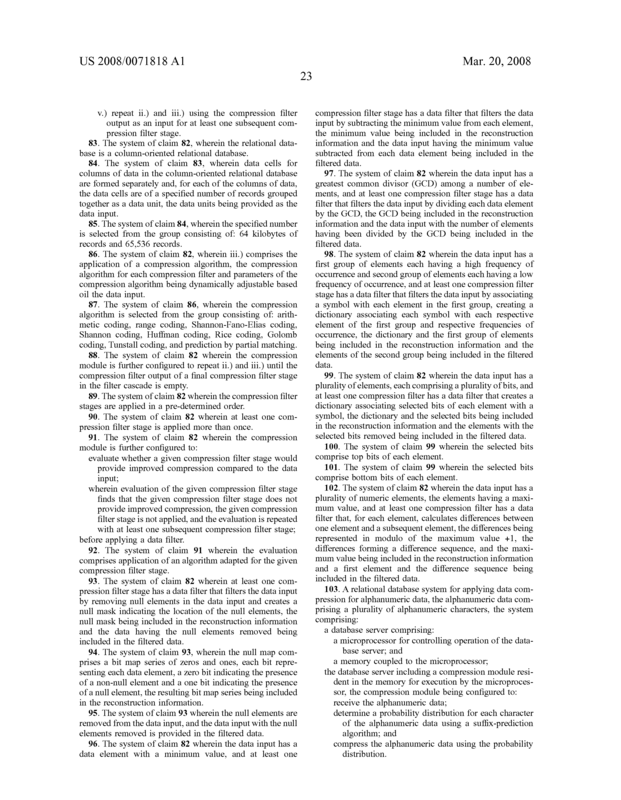 The system of claim 99 wherein the selected bits comprise top bits of each element. 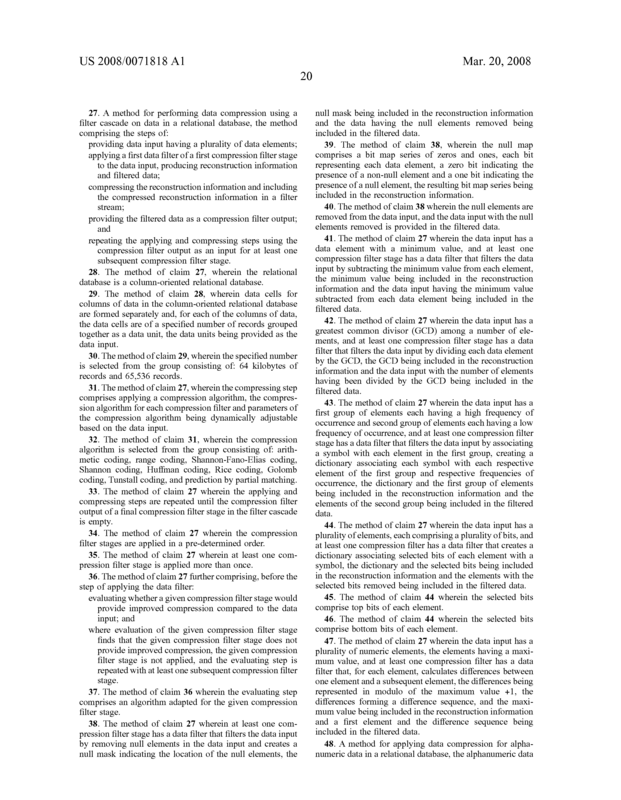 The system of claim 99 wherein the selected bits comprise bottom bits of each element. 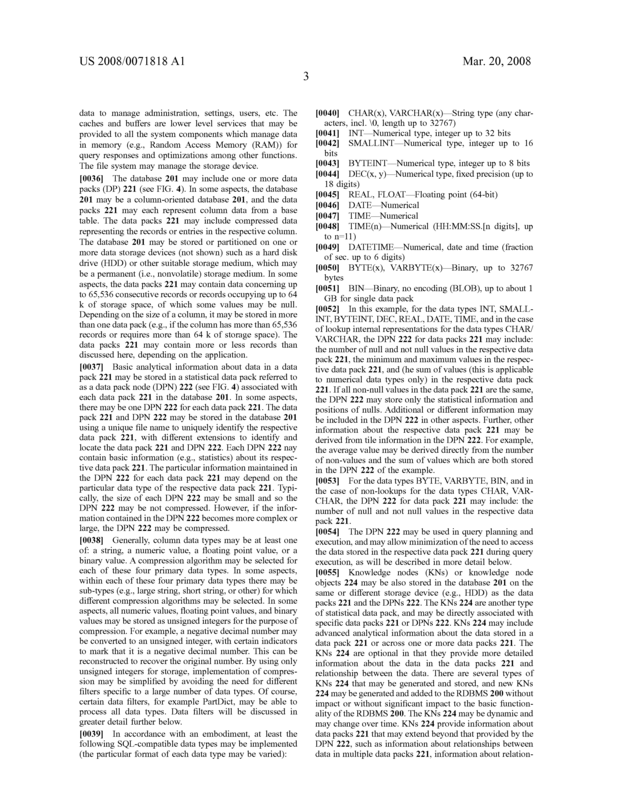 The system of claim 82 wherein the data input has a plurality of numeric elements, the elements having a maximum value, and at least one compression filter has a data filter that, for each element, calculates differences between one element and a subsequent element, the differences being represented in modulo of the maximum value +1, the differences forming a difference sequence, and the maximum value being included in the reconstruction information and a first element and the difference sequence being included in the filtered data. compress the alphanumeric data using the probability distribution. 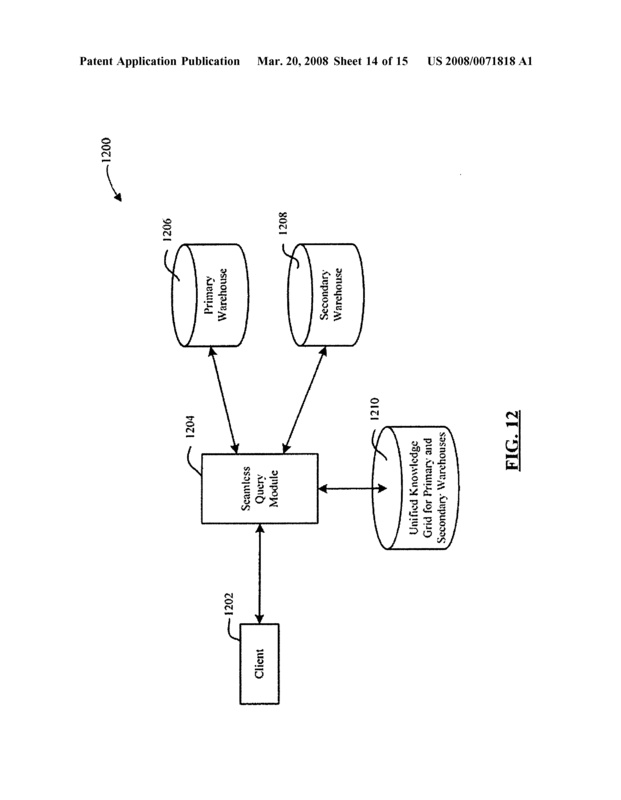 in order to perforn the suffix prediction algorithm. in order to determine the probability distribution. 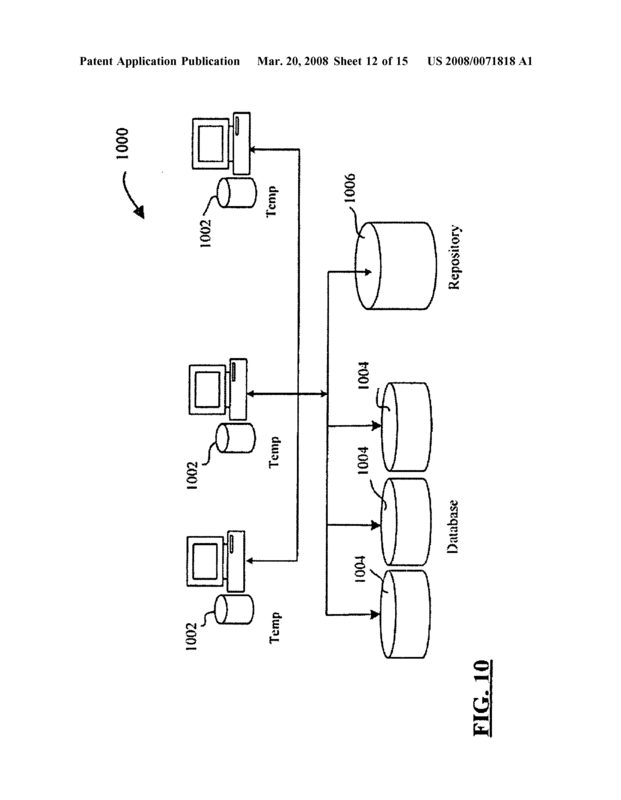 The system of claim 105 wherein the CDAWG is formed in linear time, as the alphanumeric data is processed one character at a time. The system of claim 103, wherein the relational database is a column-oriented relational database. iii.) apply corresponding decompression filters for each of the compression filter stages in a reverse order in which the compression filter stages were applied during compression. before applying the decompression filters. The system of claim 108, wherein the relational database is a column-oriented relational database. v.) code for providing the filtered data as a compression filter stage output for the compression filter stage. viii.) code for repeating code i.) to v.) for the subsequent compression filter stage. ix.) code for repeating code i.) through viii.) a total of n times, where n is an integer representing the number of stages of compression filter stages in the filter cascade.